If you haven’t read the Charley Davison series you’re missing a real treat. It a mix of humour and pathos, prophecies and adventure, mysteries and murders, fantastic characters – human and not so human – and a sensual, searing passion that transcends time. Literally as Reyes, Son of Satan, changed his fate to be with Charley. Who is Charley? Well, she’s the Grim Reaper, she helps people pass, can see ghosts and runs her own PI agency, with the help of Cookie, her scatty BFF and a few ghostly sidekicks. she’s an amazing woman, incredibly generous spirited, loyal, warm hearted, funny, and a total magnet for danger. Reapers don’t usually survive long on Earth, but Reyes is determined to change that and has the ability to drop in to her life incorporeally. He’s saved her a number of times now and she doesn’t yet realise it. Reyes thought he’d grow up with Charley but plans, even those of the Son of Satan, go awry and he ends up with the most horrific childhood. This book tells us more of his journey so far, more of what we’ve gleaned from Charley’s stories, and we see things from his side, from his first sight of Charley being born, his awful, tragic childhood, his sister Kim and long time friend Amador, he gives us the story right up to where he’s comatose and in danger of the life support being switched off. That’s when Charley finds him, I think that was about book two, maybe three. 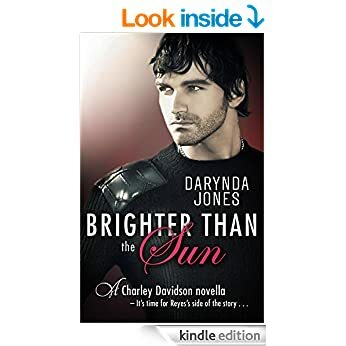 If you haven’t read the main books read them first, find out what is so special about Charley that the Son of Satan falls in love with her, goes against his fathers plans and spends his life trying to be with her, drawn in to her Light that he describes as being brighter than the sun. Its a fabulous read, a terrific insight into the mind of the man Charley loves, who we usually see only from her viewpoint or in tiny glimpses from his. This is a wonderful series and one I bought, not a review series!! Paid out Real Money 😉 Its one for my keepers file and the books are excellent value, being really full of story, of plots that keep the reader guessing, and some terrific humour to lighten the sadess of the murders and attacks that surround Charley. As we’ve got to later books things from the earlier ones that puzzled me have come clear. I haven’t actaully read book eight yet, its on my kindle waiting for book nine to come out, so I can read them back to back, because this one ends on a doozy of a cliff hanger and I know I need to be able to read what happens in the next book. Fortunately Darynda doens’t keep readers waiting years for next in series!